The title of the new novel, Corvette Nightfire, comes from the name of one of the main characters in the novel. The title also expresses the mood and energy of the story. It is a sequel to The Z Redemption, so I wanted the Prologue to bridge the two novels. It starts with revealing a little of the psyche of David James, the romantic and damaged hero of The Z Redemption, as he follows his destiny out of Mexico and into the fires of the future in the United States. 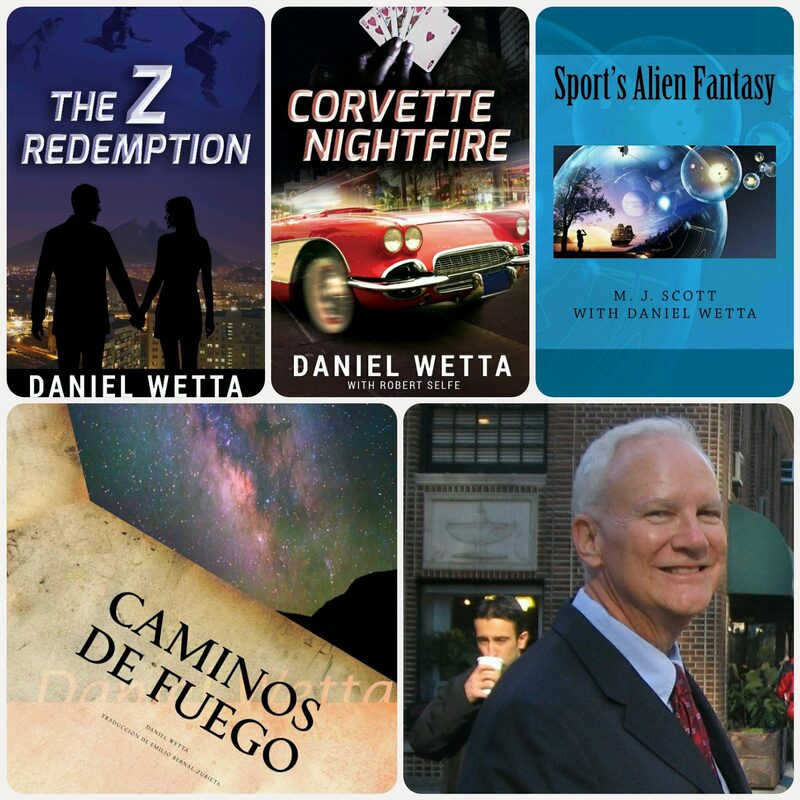 The expected publication date of Corvette Nightfire is late December, 2013. He burned spit inside him, spit and gastric juices: the waste products of intended rage. This time, he pushed the Corvette past his usual comfortable cruising speed of one-five-zero. It was a walk in the park for the Corvette. For David, it was a bullet ride over the familiar and desolate, arrow-straight highway fleeing the city limits of San Antonio. The Texas troopers left him alone when he did these midnight runs to burn off the English inside him. They knew that David fought the bad guys from Mexico and the United States and that he did it with the Zs in very creative ways. They knew he had close friends in high places, like the President of the United States, and that his woman was a beautiful Mexican celebrity of causes praised throughout the world. The troopers admired him and gave him the pass to burn the fuel of his Corvette and the sludgy garbage of his dark, previous life. Very few people knew the details of his early years. The rumor was that to know was to die. David felt the English inside him from the years he lived in Virginia, when he worked out of Camp Peary, a CIA post. He had lived with his wife and two daughters in Williamsburg, once the English capital of Colonial Virginia. The town had been restored to look as it had in the eighteenth century. His name was English. He descended from people who arrived at nearby Jamestown in the 1600s, where slaves from Africa were brought to support the tobacco and cotton economy that later sustained the South. David felt his fair skin underneath the tan that accumulated from years spent in Latin America. He knew that his skin was as white as a ghost. In his bones he sometimes felt the depressing rainy winters of England. They chilled him and threatened to make his life morose. This was why he heated his soul and body working in the climates of Colombia and Mexico, and why he gave himself to the hot passions of the Latin people. La música latina and the songs of his lover’s body underneath him were the self-prescribed drugs for the chronic heaviness of his moods. He never meant to disparage English people, but in his mind the English DNA in his body was toxic to him. When he felt like he was dripping English, he had to race. He purged his craziness by going for the speed of light. He knew that none of this was logical. He had found out that life did not have to be logical. It only had to have purpose. He owned one of the earliest seventh-generation Corvettes. Red. Rojo. No one could see its color when it took its midnight paces. To the troopers, the Corvette missile streaking past them was a sound and a light trail. A new recruit had gone after David once, and when David was done, he had pulled over to accept his ticket. But something in David’s eyes, some purity of insight, impressed the young trooper that David was a man of unfathomable commitment to secret crusades for good. He let David off with an admonishment to “be careful out there.” He did not understand why he did it, but he felt justified in his heart for having done it. He told other troopers about this, and the troopers nodded their understanding. This night, David had the rage that would not be exhausted until he hurled the Corvette to its top speed. He always bonded with his Corvettes. This new one needed to understand his tentative sanity. If they both pushed to the limits of their possibilities, then there would be trust between man and machine. David saw 186. He started a deep-throated growl that accelerated into a howl at the moon above him in the Texas flatlands. He intensified his wail. He saw 196. He bayed until he almost slumped from lack of breath. The inhale that followed whistled violently, convulsing his chest. His eyes spit tears. He had seen 202. He knew he was going to win. The cartels had taken the money. Almost all of it. They had killed people to do it. They had not come to kill him or his woman. Instead, they had aimed their AK-47s at the foundation of the Zs in order to deprive them of their dreams and hopes. Now David was coming for them. The cartels had made it personal again. With the cartels, it was always personal. He would point his howling Corvette in the direction of Las Vegas. He had found them there, and they were going to see his eyes. Thank you so much for your encouragement, Kharis! I am working steadily on the sequel. Good luck to you on all your endeavors as well!